To translate and deliver the wisdom of Daoist and other shamanic teachings to the world giving people the tools to live their most powerful, aligned and authentic lives. I’m thrilled to invite you to join me for the first Pathfinder Retreat, November 9-11th at the amazing Racebrook Lodge in the beautiful Berkshire Mountains. I handpicked the retreat space for its deep connection to nature, comfort, beauty, and soothing environment. This was, as you might imagine, an easy question to ask with far too many answers. Then I remembered what we always say in class. I started making lists of things to share that would help people on their own pathfinder journey. I want you to know what it means to let the Dao guide you. I want you to recognize your true nature and honor it. I want you to see the power of community to transform together. I want you to see what it would feel like to live a completely conscious and empowered life (and about a million other things). The answer arrived in a moment of walking in the neighborhood (where my best thinking usually happens). Feeling the ancient wisdom of nature in our bodies and our spirit. Discovering the Dao of nature and the shamanic teachings held within it. To feel the connection we have to the stars and the trees and the animals because we are all made of the same thing, we all carry different reflections of the light of existence. To develop skills of self-awareness and understanding the energy of the Dao/field in the familiarity of the natural environment. In this weekend we will use the tools of breath, movement, sound, contemplation, and interaction to activate our essential nature. We will begin by arriving in nature and we will leave knowing that WE ARE NATURE. I named the retreat AWAKEN because of the excitement that happens when you are practicing something and suddenly you enter into a flow state and can see the interconnectedness of everything through that one thing. Whether you are a yoga practitioner or golfer or baseball player or digital coder, there is this moment of flow that happens where everything becomes one. In that moment, you are in the present and the infinite. Mindfulness practice is designed to bring you into these moments of experience. When this happens you realize the incredibly rich tapestry of life that we live in. Once that has happened we usually feel like staying in that space all the time. The question keeps arising for people: How do I stay there, in the awareness of the moment? Continuously attend to the moment at hand. But as you may have guessed that appears to be very difficult to do. The reason this is so difficult is how much bandwidth you have. Imagine your mind is used to processing information and immediately chunking it into the following categories: good or bad, relevant or irrelevant, now or later, etc. This activity of chunking out information means you’re using processing power. Imagine the spinning wheel on a computer as you wait for it to process a complex command, or the lag on a video game, or when a live video you’re watching freezes. We experience the shortcomings of linear processing of data all the time. For a while now in the computing world, we have just lined up more and more processors and more and more memory to keep enlarging the amount of data that computers can chunk out, but it doesn’t solve the problem for the really big equations. There are questions that science would love to have the answers to, but the best computers would take thousands of years to answer them. The journey from the many to the one is the journey of going from complexity to simplicity from the ten thousand things, to the five elements, to the three treasures, to yin and yang and finally to the one. The Ten Thousand Things refers to the phenomenological world as we know it. The Five Elements is a way of chunking reality into the Earth at the center and the four remaining elements connecting with the cardinal directions Water (north) Fire (south) Wood (east) Metal (west). These elements represent parts of the body mind and spirit as well as aspects of our solar system and the universe. The Three Treasures are about understanding the greater relationship between the earth, human beings, and the heavens. When we understand The Three Treasures, we start to see patterns in our lives and a greater expanse of understanding, where a moment can last a few hundred years. Yin and Yang refer to the duality of all things but also the idea that there is a holistic container surrounding this duality. Opposites always grow out of each other and that we are creatures who understand the world by understanding change. The One refers to the time/place before yin and yang, before differentiation, the moment before the big bang. Practically, for us as practitioners, the one is the place of stillness, where the turning of the world stops. It is the pause between the inhale and the exhale, it is the infinite moment which takes time away and allows us to perceive what we are experiencing in ourselves and in the field with precision and almost prescient clarity. Meaning for us is always relative, not absolute. On the AWAKEN retreat, you will learn a method based in tradition, art, and neuroscience to bring yourself into communication and resonance with oneness. We will experience the shamanic map of nature. Through Qi Gong practice, meditation, writing, nature walking, and music, we will reflect upon the wisdom of the ancient world all around us. You will learn how to tap into this energy and use it as a guide. This is the wisdom of a Pathfinder. The community and teachings we have studied and designed at Pathfinder Institute in NYC is infused in this retreat. As well the wisdom of the many teachers I have had over the past 30 years will be with us. At Pathfinder we know that communities help individuals to grow faster and reach higher. 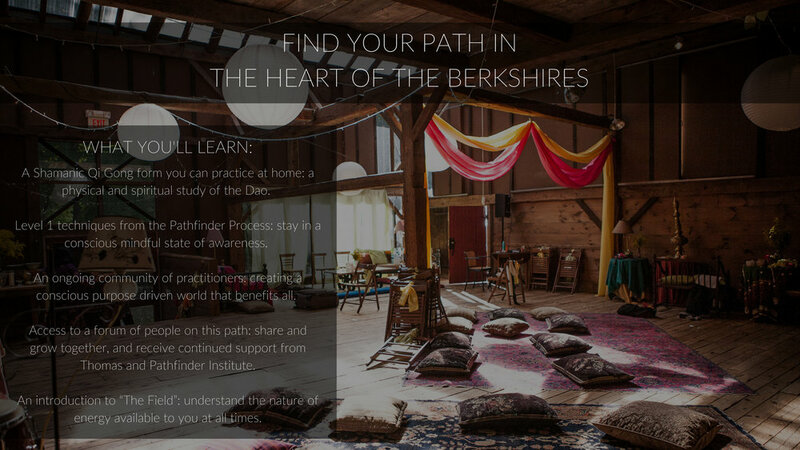 We will activate this community and the greater community of nature in the Berkshires to open our consciousness. This training is the beginning of a series of educational programming that brings movement, daoism, contemplative training and community synergy together into an explosion of transformation. It is an honor a gift and a tremendous joy that I am able to share this work with you. A Shamanic Qi Gong form (set of movements) you can practice at home. Level 1 techniques from the Pathfinder Institute. Awaken to the Dao: Using Nature to unlock the Dao/field. Feeling the wisdom of nature within. An ongoing community of practitioners: creating a conscious purpose-driven world that benefits all. Access to a forum of people on this path: share and grow together, and receive continued support from myself and Pathfinder Institute. An introduction to “The Field”: understand the nature of energy available to you at all times. P.S. Early bird prices end on July 23rd. 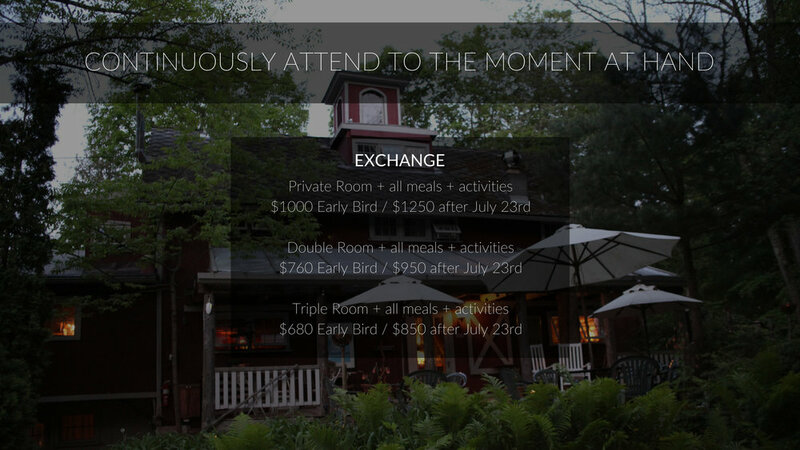 Book now to save 20% off the total retreat price. November in the Berkshires can get quite cold, so please come prepared with sweaters, a jacket, hat, rain gear, and good hiking boots if you think you might like to get outside in the wilderness. Please bring comfortable clothes for practice, as well as anything else that allows you to feel nurtured. Linens are provided by the retreat center.